Q: Why do people have pre-wedding shoots? What’s it all about? When most people think of a Pre-Wedding shoot, the first thing that comes to mind is the dread of having their photo taken. A lot of people don’t like being in front of the camera and thats perfectly understandable – I can totally relate! My happy place is behind the camera, so when it was my turn for a Pre-Wedding shoot I was just as nervous as you! I personally think that Pre-Wedding shoots are SO important for many reasons…and surprisingly photographs aren’t one of them. A big part of a Pre-Wedding shoot is getting to know your photographer. You can see first hand how they work, how they pose you, how comfortable they make you feel and what it will be like working with them on your big day. They also get to know you a bit more. They see how you act together as a couple and find the best ways to photograph you so your personalities shine through. They also get to talk to you. 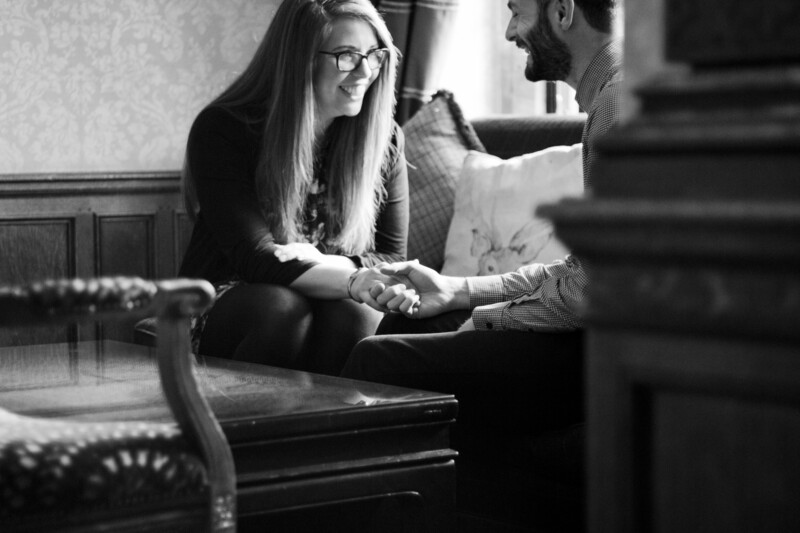 I love chatting to my brides and grooms at their Pre-Wedding Shoot, sometimes we spend more time chatting than we do taking photographs…and thats okay! The more your photographer understands you as a couple, gets to know your wedding plans and dynamics, the better they can do their job. The Pre-Wedding shoot is a great opportunity to do a test run of your wedding hair and make-up. Not only will you have the chance to see how it looks in photographs but you’ll also be able to test how it lasts throughout the day. You can also use your Pre-Wedding shoot to get to know your venue a little better. Hunt out your favourite spots…or your not so favourite spots, to find the places where you want your photos taken on the wedding day. You Pre-Wedding shoot can pretty much be anywhere, it doesn’t have to be in your wedding venue. You could choose your favourite place, or the place you got engaged. Use it to tell the story of you as a couple and the places that are important to you. Go for something truly personal and have your shoot at home! When it was my turn to be in front of the camera, I had my Pre Wedding Shoot at home! Even if you’re a person who loves having their photograph taken or is a selfie king/queen, being in front of a professional camera is a very different experience and it can be nerve wracking. So use your Pre-Wedding shoot as a practice, embrace the experience and talk to your photographer if you’re feeling nervous, they can help! So many of my couples say that by the end of the shoot their nerves have disappeared and it really did help them feel more relaxed at the wedding. The aim of a Pre-Wedding shoot is to have fun; feel relaxed; and get to know your photographer. You will of course get lovely photographs of the two of you…but they are just a BONUS! I really do believe that Pre-Wedding shoots are so valuable. I encourage all of my couples to have one which is why they are included with every wedding booking! Natural Wedding Photography in Liverpool and beyond. Range of Wedding Photography Packages available. Get in touch for more details http://www.lucyhannahphotography.co.uk/Liverpool Wedding Photography. Liverpool Pre Wedding Shoot.